Adopting the typical New York attitude of “EAT ME!”, the Empire State-themed Nosh Delicatessen will inspire you to do just that. From a couple with an extensive history in the restaurant biz, this new Encinitas deli featuring exposed brick walls and checkerboard floors is the first of three planned SD locations, aiming to dazzle West Coast senses with NYC flavors, though hopefully, none of the smells. Just like Young Money, they've got mad bread (rye, challah, cranberry-orange-walnut loaf, +9 more!) to hug classics like corned beef and pastrami, or opt for more adventurous moves like beef tongue, jumbo lump blue crab meat salad, and beef liver that may feel cool for being the “chef's secret-recipe”, but really is just chopped liver. 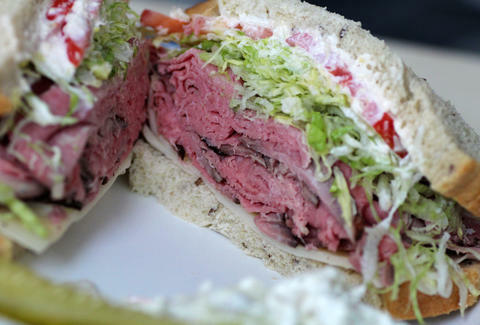 If those overstuffed 'wiches sound a little thin, opt for one of seven, multi-meat specialties like the pastrami/ turkey breast/ Muenster “Empire State”, or a corned beef/ pastrami/ Swiss mashup called “The Boss”, which is covered in Russian dressing as a nod to the time Khruschev kidnapped Springsteen after grossly misinterpreting the lyrics to “Red Headed Woman”. The kitchen'll also be brewing homemade soups (matzoh ball), and popping open early to serve weirdos-who-rise-before-noon bagels with cream cheese/lox, and more substantial fare like a Croque Madame panini on challah French toast, which sure beats merely taking down a Big Apple.